For the past 6 months, I’ve been obsessed with speeding up my WordPress websites. Thanks to the optimization process I’ve documented here, my websites were able to load pretty fast already. But that wasn’t enough for me. I always wanted to get the best speed possible. 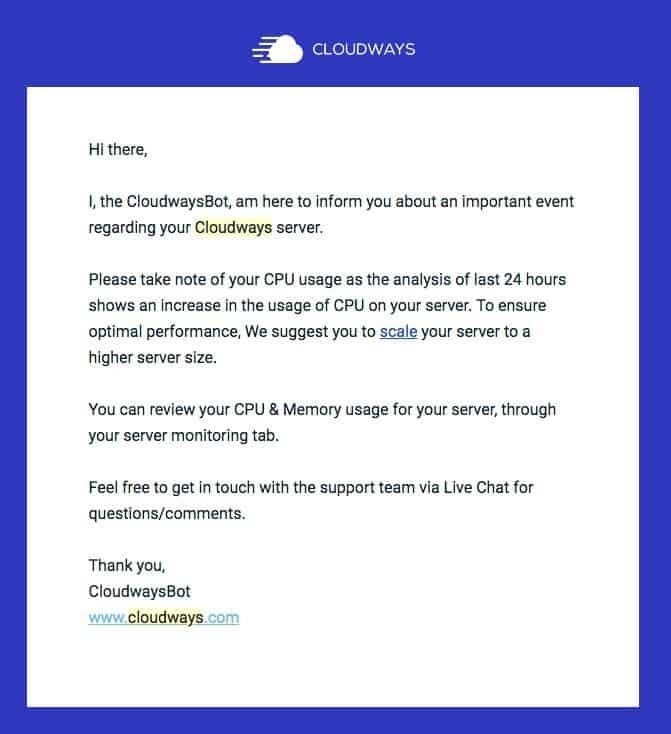 So when my friend Brendan Tully (who runs WPSpeedFix) told me about Cloudways and how it could get me a better performance, I decided to sign up for an account to test. I migrated one site from WPX Hosting to Cloudways, and it instantly loaded 2.4x faster. This site had a lot of images so being able to load in less than 1 second definitely made me very happy. I have since migrated all of my websites (except Cloud Living) to Cloudways and have been mostly happy with them. I’ll tell you why below. 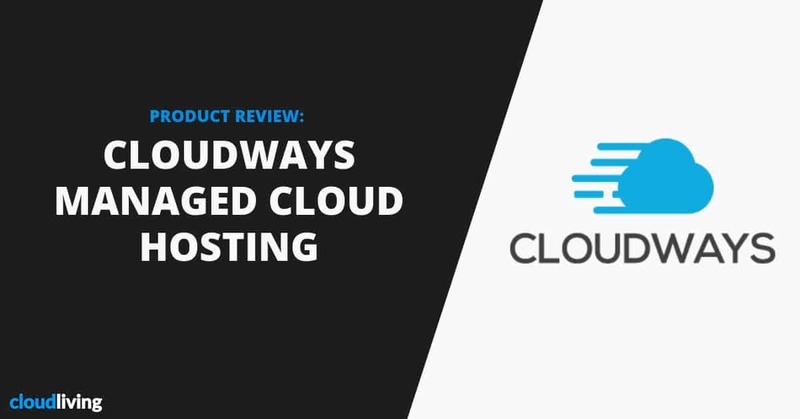 In this review, I’ll be sharing with you what I liked and didn’t like about Cloudways after a few months of testing them quite intensively on my own sites. 2 What Exactly is Cloudways? 5 What People Are Saying About Them? 6 Conclusion: Do I Recommend Cloudways? Black Friday & Cyber Monday are behind but they have extended their Black Friday promo campaign until December 5th. Use coupon code BFCM18 to get 30% off for the first 3 months. I’ll be receiving a commission if you decided to purchase Cloudways using my affiliate link. If you do, forward your receipt to tung@cloudliving.com and I’ll give you my Site Building and Optimization checklist which I use myself to start any new WordPress site. I genuinely appreciate your support. I only write reviews about products I love on Cloud Living and each review is backed by evidence in the form of personal testing & real user feedback. If you don’t want to use my affiliate link, here’s a non-affiliate link to Cloudways. Either way, I truly believe this is the most affordable managed WordPress hosting that will help your site run faster and more reliably. You can do your own research on Google and Facebook groups and you’ll find most people saying the same. CloudWays is a managed cloud hosting platform that allows you to deploy multiple applications including WordPress, Drupal, Joomla, Magento and more in just one click. Unlike other managed hosting providers, they actually don’t operate any physical servers themselves. Pricing is a little complicated, as it depends both on the server spec you need and the cloud provider you choose. 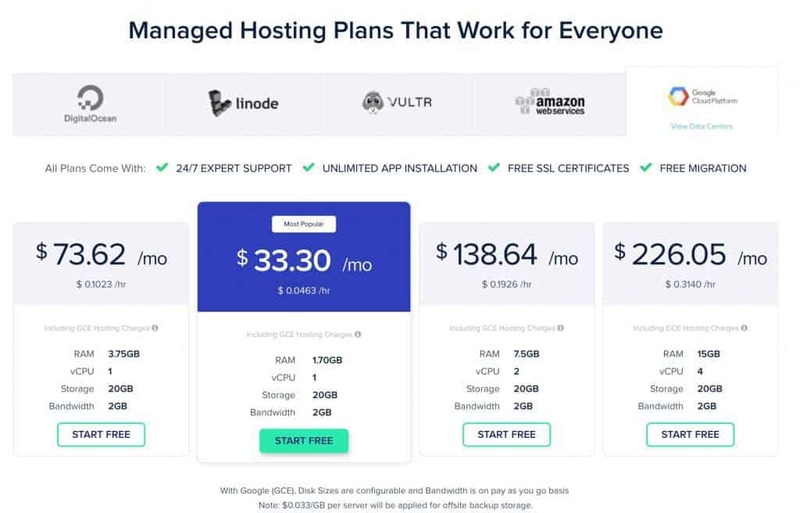 You’ll see that Cloudways’ pricing is higher than the listed prices on any of the providers’ websites because they add a management fee on top of the base prices. That also covers for customer support via 24/7 live chat and ticket for any hosting-related issues. 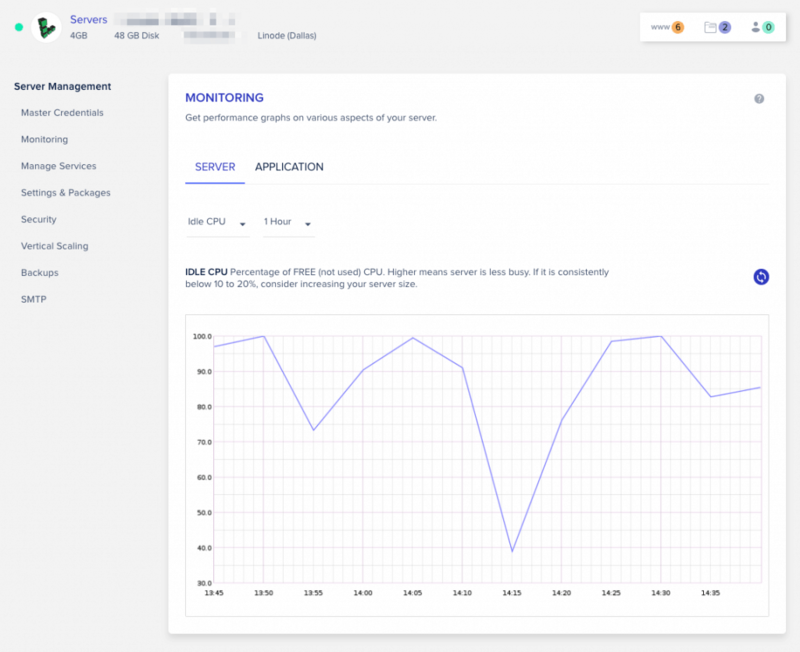 Servers deployed on Cloudways are automatically configured with the most optimized technology stack to provide you with the best speed, performance & security. That means you wouldn’t need to spend time learning to manage servers or hire a developer to help manage your servers for you. All that time saved could be spent on actually growing your business instead. When your sites are hosted on your own cloud server, you’ll not have to share resources with anyone else. That means better & more reliable performance. You also won’t have any similar limitations that most shared hosting will put on your account. For example, Siteground has quite low CPU limits for their hosting plans and once you reach the limit you would either have to upgrade or their system would automatically take your site offline until the issue is resolved. Cloudways has different pricing plans depending on the cloud server providers and sever specs you choose. The higher the specs, the more you pay. This is great because you only pay for what you need. My recommendation is to go with Linode since they’ve consistently been showing the best performance during my tests. 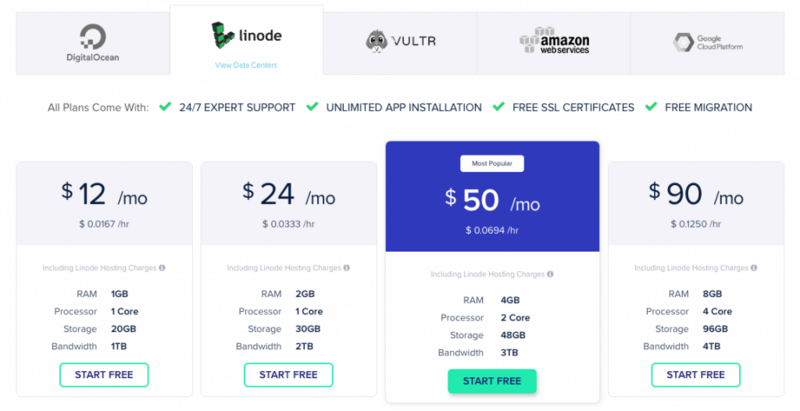 Google Cloud Platform and Amazon Web Services are a lot more expensive and don’t seem to provide as much added benefits compared to Linode. Digital Ocean has always been the slowest cloud provider so it doesn’t get my recommendation. If you’re starting out, the $12 / mo Linode plan would certainly be enough. But as you grow, you might need to switch to higher plans. The great benefit of using a cloud server is that you can set up as many sites as you want on your account. But as your traffic increases, you need to pay attention to your IDLE CPU percentage. If it is consistently below 20%, then that’s when you should upgrade to a stronger server. Scaling a server is as easy as dragging the slider to the right and click “Scale Now”. It would take only 5 to 15 minutes to complete the process with no downtime on your website. Click here to read their documentation on scaling server size. Cloudways has done a great job at making a simple and easy to use admin panel. 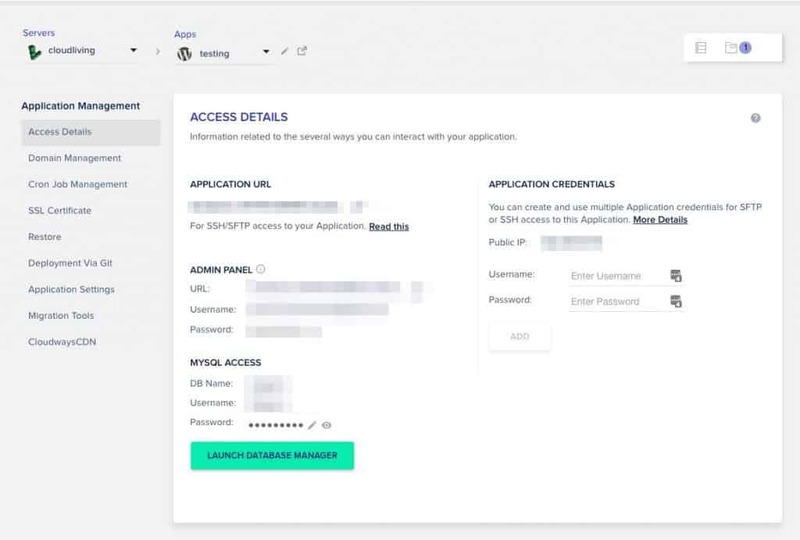 They don’t have too many confusing options like CPANEL (it’s what most hosting companies use) and only feature what you need to deploy and manage your servers/applications. After signing up for a trial account and logging in, you’ll be prompted to deploy your first server. Just fill in the required information, choose the smallest Linode plan, pick the location closest to your audience, and click “Launch Now”. I’ll take approximately 7 minutes for your server to be ready. A default WordPress installation is already created when you deploy your server. However, if you want to add more. It’s very easy! Select WordPress from the first dropdown, name your app, select the project this new application belongs to and click “Add Application” one more time. In just one minute, your WordPress installation will be ready. Now click on Domain Management, enter your domain in the field and click “Save Changes”. Now all you need to do is to point your domain to your server’s IP address and your site will be live! When you launch a WordPress application using Cloudways, they’ll automatically install their own caching plugin on your website called Breeze. It’s fairly simple to configure and can be a good alternative to W3 Total Cache or WP Rocket. I tested it on a few sites and the results look comparable to the 2 plugins mentioned above. Here comes the part I love the most about switching to Cloudways. They have made the migration process incredibly simple and easy. Just install this Cloudways WordPress Migrator on your website, fill in your new application details, click Migrate and you’re done! Your WordPress site will be migrated over to Cloudways very quickly. This really saves you a lot of time and money as you no longer have to wait for your developers to do the migration for you. A staging environment is used when you want to create a clone of your site for testing and development. Once the staging environment is set up, you can push and pull changes to test the application. With Cloudways, you can set this up in just one click. This is a pretty standard feature that all hosting providers should have. So there’s really not much to talk about this. You can set up automatic backup or take an on-demand backup inside your Server Management panel. Cloudways also has a documentation on this here. If you have a team then this is a really easy way to give them controlled access to your Cloudways account. More on this feature here. This seems to be the consensus after talking to many Cloudways customers. Their live chat support is generally good – but not consistent. Sometimes wait time can be slow and the quality of support agents also varies. However, I’ve talked to their management team about this and they’re working very hard to improve customer support significantly. I first wrote this review in October 2018. At the time, I felt like their customer support wasn’t that great and gave it a rating of 3 out of 5. However, over the past few weeks, I’ve noticed the quality of customer support has clearly been improved. I’ve been throwing them a bunch of difficult technical questions and they have been able to help every time. There are still rooms for improvement. But overall it’s been a lot better since October so I decided to adjust the rating to 4 out of 5. 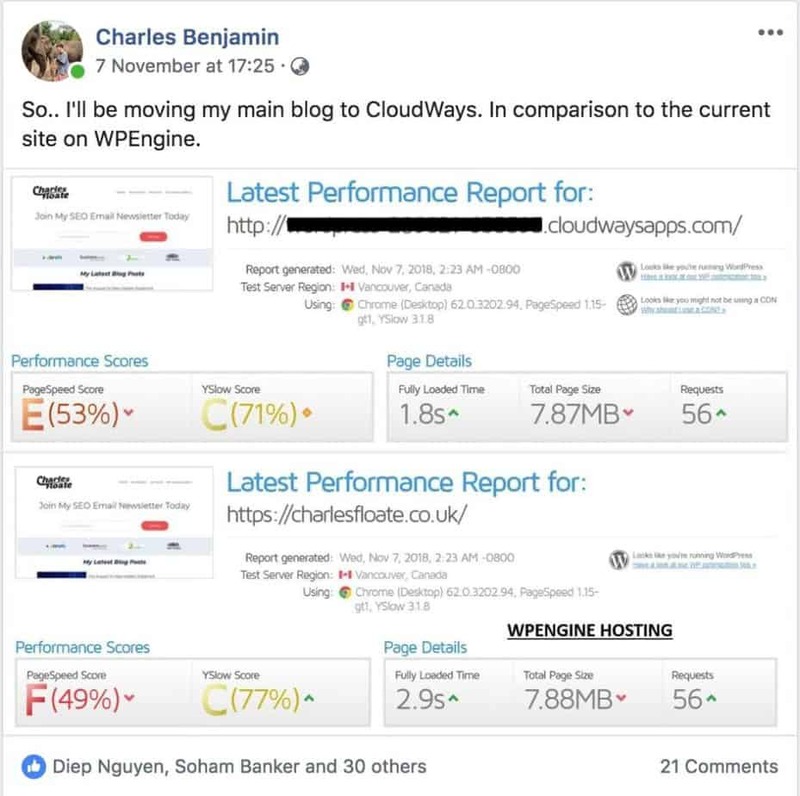 In addition to doing my own testing, I also spent quite a bit of time researching real users’ feedback about Cloudways on Facebook groups and other hosting review sites. 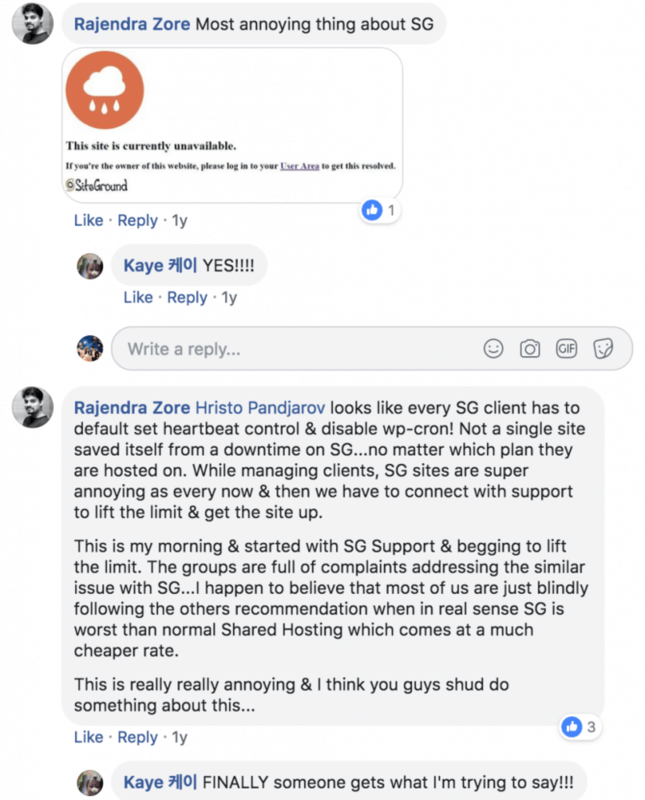 Here are a few more big discussions about Cloudways inside this FB group. You have to join as a member to read the links below. Is Cloudways worth the extra cost? Should you run your own server? How does Cloudways compare to managed servers? Is Cloudways’ support really that bad? Conclusion: Do I Recommend Cloudways? As I said earlier, I have moved all of my most important money websites to Cloudways in the past few months. And trust me – that decision wasn’t made lightly as a fast & reliable hosting is the foundation of any website’s success. They’re certainly not perfect. But their affordability, performance, and flexibility are hard to beat. Still on the fence? Sign up for the 3-day free trial to test their platform and see for yourself. Don’t forget to use this coupon BFCM18 to get 30% off for the first 3 months. This coupon will expire December 5th. If you visited Cloudways on any of the links on this article, I’ll get credited if you ended up spending money with them. So don’t forget to forward your receipt to tung@cloudliving.com to receive my Site Building & Optimization checklist. I am too a fan of Cloudways but more inclined towards Digital Ocean. 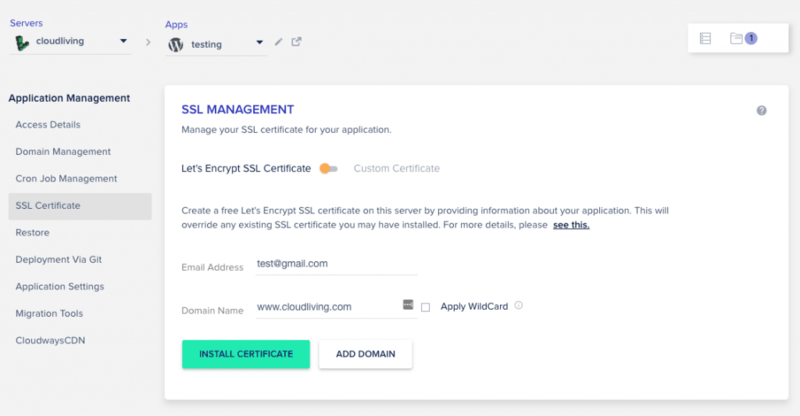 DO offers features like Floating IP, free of cost, which helps you create highly available server structures without a single point of failure. The only thing is that you have to create server on DO directly to avail these services. Yep. I too don’t want to waste time on that. 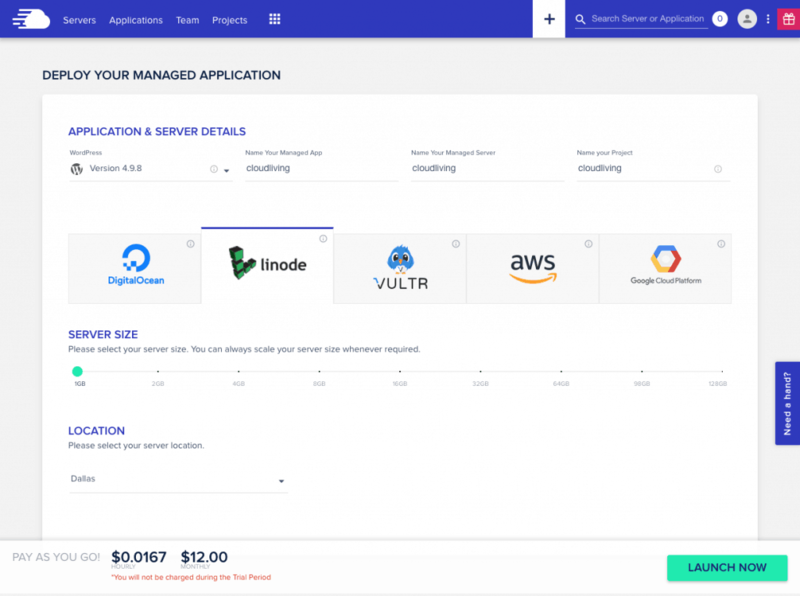 But, there are services available under $10 like Runcloud (using it) which manage your servers on your behalf. In the end, you are creating a server structure that can never go offline and things can be automated with DO in such a way that if primary server fail, it will automatically switch to secondary server. Hi Tung, WPX Hosting now includes its own custom CDN for free and is pretty much untouchable on speed around the world: https://www.matthewwoodward.co.uk/experiments/best-wordpress-hosting/ (Matt wants to include Cloudways in the next speed shootout). Nice to see you here. I wanted to email you actually. I absolutely love WPX and didn’t want to leave. I tested WPX Cloud on this blog and didnt notice an improvement over Cloudflare. Thanks Tung, I will contact you via email and discuss further. There will be something specific causing a bottleneck and we will find it. 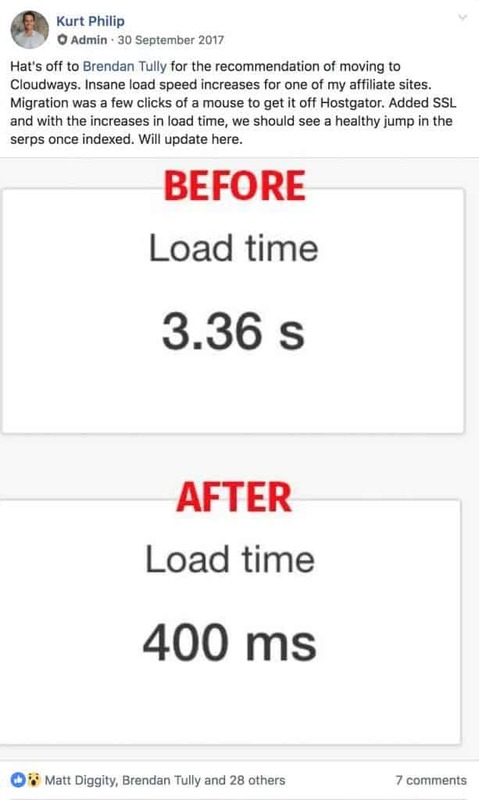 Have you tested the site loading speed on mobile using https://testmysite.withgoogle.com ? Would you mind doing it, and sharing the results?